The cry of the poor finds a deep echo in the Apostle’s heart. She is called to labor diligently and to serve all, especially the poor and the marginalized, with generosity. 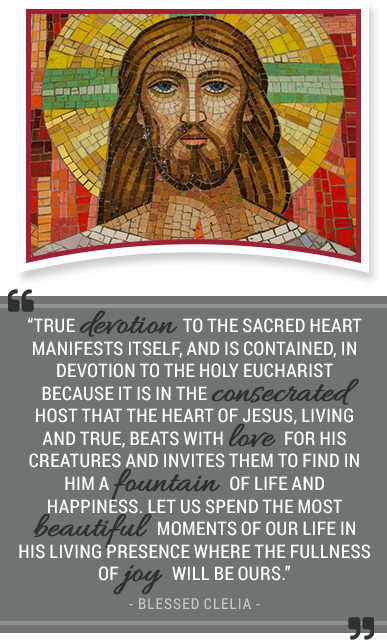 For the Apostle, devotion to the Sacred Heart of Jesus is, as our foundress Clelia Merloni desired, “the first and most beloved of devotions.” It is at the center of her spiritual, ascetical, and apostolic life. Blessed Mother Clelia Merloni urges the Apostle to be before she does, to adore before she witnesses, and to witness with the power of Jesus, who makes himself light, love, conviction, and redemption, present within her. Above all, the Apostle actualizes her reparative offering in fidelity to her daily duties where humble service, active charity, patience, and the endurance of physical and moral suffering become a sacrifice of love and expiation.